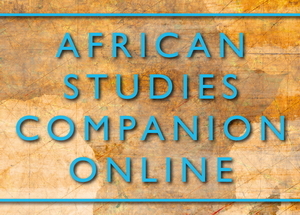 The African Studies Companion Online is an invaluable tool for scholars in African Studies. It contains over 1800 entries covering guides and resources for African languages, Africa cartography and maps, African film, African studies journals, magazines and newsletters, media guides and news sources for Africa, the African press, African studies library collections worldwide, national archives in Africa, centers of African studies and African studies programs worldwide, awards and prizes in African studies, and a wealth of other subjects. Many entries describe and evaluate resources, others are factual and provide practical information. With a few exceptions, all entries directly link to the internet.